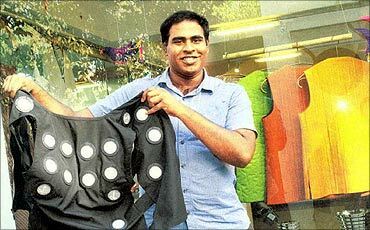 Rediff.com » Business » At 26, he made a climate-proof jacket! At 26, he made a climate-proof jacket! Teachers called him a 'rebel' while he was in school. The quest for knowledge made him raise many questions, which were disliked by teachers who considered his doubts a waste of time. Unlike other students, Kranthi Kiran Vistakula was never interested in marks, he only wanted to learn and understand everything. "I was very curious about everything under the sun. This curiosity often landed me in trouble. While many thought I was a trouble maker, it was actually my genuine pursuit to explore and understand things in the right perspective," says Kranthi. Fortunately, his parents were very supportive. They gave him the freedom to learn and never pressurised him to score high marks. "In India, the education system is too examination oriented, killing the creativity in students. You are taught not to think differently. This mindset has to change," Kranthi points out. The school teachers who deplored him are now amazed to see his success. Not just his teachers, he has won global recognition for one of the most outstanding innovations. He holds a patent for the ClimaCon technology. 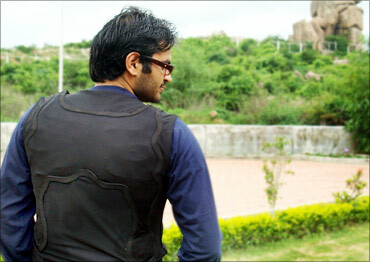 Image: Kranthi Kiran Vistakula with the climate control jacket. "This ClimaCon (climate control) technology can be incorporated into any kind of apparel/accessory to provide both heating and cooling on demand. We have launched jackets, helmets, neck scarves, gloves which help users to choose the temperature between 4 to 45 degree Celsius, providing comfort (warmth or cold)," says 29-year-old Kranthi, CEO, Dhama Apparel Innovations. The ClimaWare products will be available in medical stores and retail outlets by the end of December. After doing his Masters at the Massachusetts Institute of Technology, Kranthi came back to India to build the product, which won him MIT's business plan competition. He founded Dhama Apparel Innovations in 2008 to develop a range of products for personal, military, industrial and sports using the ClimaCon technology. He has won the gold medal at Lockheed Martin India Innovation Growth Programs Innovator's competition and India Innovation Pioneers Challenge. He was also the co-principal investigator in a NASA project to create a mechanism to generate electricity using proteins for space applications. "The individual intelligence of Indians is higher than foreigners but when it comes to group intelligence, foreigners score high. 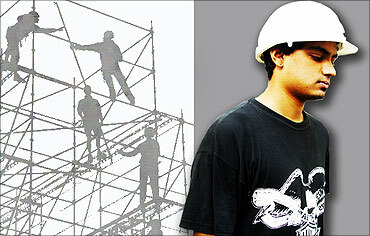 That's why when an Indian goes abroad, he works well in the group and does a commendable job," he says. 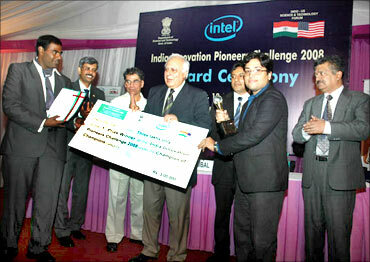 Image: HRD Minister Kapil Sibal presents India Innovation Pioneers' Challenge award to Kranthi. 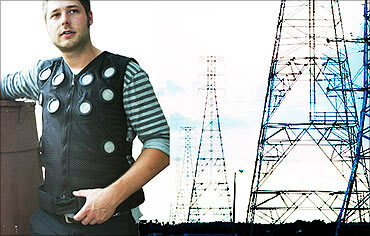 How did the idea of the ClimaCon jacket come about? What long did it take for you to make this jacket? While I was studying at the MIT, the cold winters were unbearable. I had to wear layers of clothing to keep myself warm while going out. Once inside, I had to remove them as the rooms had centralised heating systems.I used to feel very uncomfortable doing this. It was then that I thought of finding a solution for this problem. Initially, it was more fun than work to me. But the most difficult part was finding time to do the experiments when I had to spend 80 hours every week on research and classes. I tried to find as much time as possible, many days spending 11-12 hours and finding time during the weekend as well. The MIT business plan competition won me an award of $1000, which was a great morale booster. It was difficult to meet all sorts of requirements while making the jacket. After I made the first prototype, I realized that I could make a range of products with this technology that can benefit people all over the world. 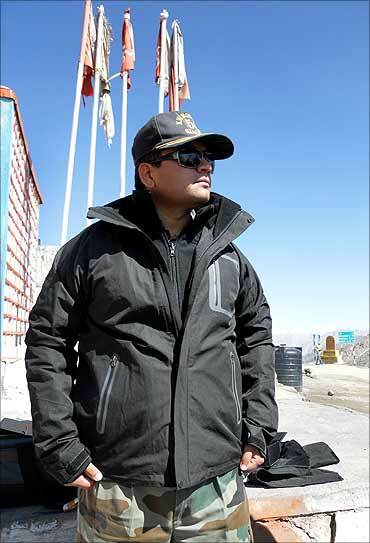 Image: ClimaWare jacket for military. What are the features of the jacket? How much does it cost? Dhama's ClimaCon is a patent protected technology. It is a combination of thermoelectric, heat sink and efficient heat transport mechanisms. 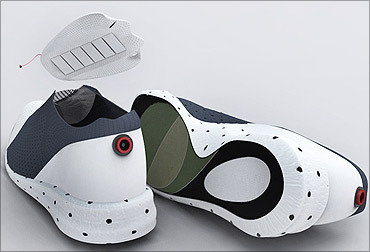 The technology can be incorporated into any kind of apparel/accessory to provide both heating and cooling on demand. ClimaCon is designed to supplement the human body's thermal regulation by not obstructing the sweat evaporation. For maximal effect, the cooling/heating points are strategically located on places where sweat production is minimal and there is high concentration of blood vessels. Our products incorporate this technology allowing the user to choose the temperature between 4 degree Celsius to 45 degree Celsius, providing comfort warmth or cold). The jackets have different variants so the price ranges from Rs 13,000 to Rs 40,000. 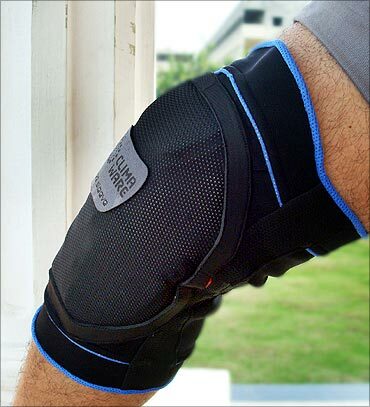 This application enables the wearer to remain in any harsh environment without stress, discomfort, health problems, or lowering productivity. This feature also enables us in developing medical products for providing relief to the patients. ClimaCon technology is superior to all existing technologies such as phase change or vapour compression as it is active and is the lightest. Our products are lightweight (jacket - 800 gm, it is one third the weight of current active products, neck wrap 80 gm, knee pack- 320 gm), fashionable and aesthetic, easy to use, and have no moving parts. The temperature can be changed with a remote control device. They are powered with rechargeable batteries lasting 4-8 hours per charge. 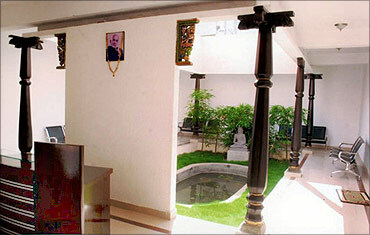 The products are developed at our manufacturing unit at Hyderabad. What are the other products on offer? ClimaWare-neck wrap is an extremely lightweight product for use in extreme temperatures. Powered with rechargeable batteries, this neck wrap is capable of neutralising the effects of adverse climate on the entire body by cooling/heating the blood that flows to the brain. We have shoes that help you choose the temperature your feet like the best. 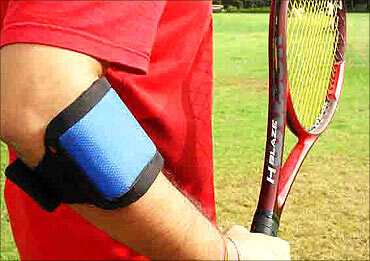 Another product is the ice pack, currently, if you need an ice pack you have to take ice from the refrigerator. But with our ice pack, you no longer need to make ice. It will be very useful in hospitals and in some industrial sectors and the army. Who are your customers? How has their response been? We have sold only 25-30 jackets so far to the Indian Army and the US Army. They are testing our products. 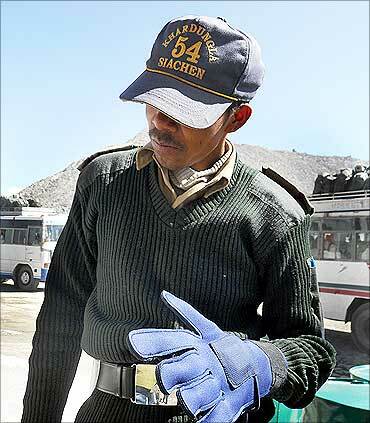 The India Army at Siachen and Himalayas are in need of such apparels as they face adverse weather conditions. The India Army would like the products to be more customised. They want the jackets to be powered by the vehicle. We can easily incorporate such changes. We expect them to place an order soon as they are testing the product. People have given us a good feedback and we are hopeful of getting bulk orders soon. How was your experience at MIT? MIT was a great experience, a life changer. It is one of the best places to do research. It broadened my horizons, changed my outlook completely. I also got an opportunity to work on a project with NASA as a part of the academics. What was your ambition as a child? How did you perform in studies? I wanted to become a scientist. I was always yearning to know more about every subject. I always sought explanations and if I was not satisfied with the answer, I used to try and find the answer myself. I was never among the top scorers. But I always knew that I was more knowledgeable than the top rankers. I used to take part in sports as well. Were you innovative during your school, college days? I used to take part in science fair and competitions. I won several competitions. My experiments often landed me trouble as well. Once, I took calcium carbide from the school lab and tried to create a flame. I added water and it exploded. I got hurt as well. I have also got electric shocks several times during my experiments. Everyone thought I was notorious. My parents have been called to school many times. But I was lucky beacuse they understood me very well. How did you start off? What kind of constraints did you face initially as an entrepreneur? Once I made the prototype, I decided to come back to India. I got one of the best job offers but I declined it to start my own venture. With the support of the government's Technopreneur Programme, Dhama Apparel Innovations started off at the National Institute of Design's business incubator in Ahmedabad, Gujarat. Today it operates independently from Hyderabad. Though specialised apparels have a good business potential, I knew I was taking a big risk. I did not have enough capital. I had never worked anywhere so I had no savings. All I had was $1000 I won from the business competition at MIT. I believe if you have the motivation to do something, you can achieve a lot. There were days when nothing would go right. I used to spend many sleepless nights, working out things. At the same time, friends who studied with me had got good jobs and they were driving around in luxury cars like Audi, whereas I was struggling to make ends meet. Even now, I have won only half the battle. Getting a market for the product is the next big challenge. We are in talks for marketing alliances. 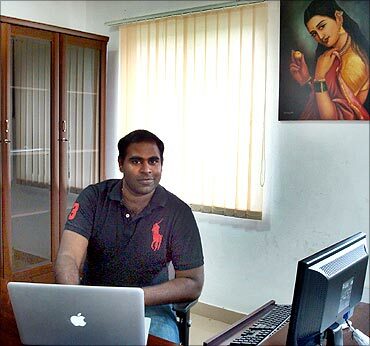 Image: Dhama Apparel Innovations office. How much has the company invested so far? Initially, I got a grant of about Rs 60 lakh from the government. The total Investment is around Rs 5 crore (Rs 50 million). We are set to break even within a year. We are set to break even within a year. What is the business potential of specialised apparels? What are your revenue projections? We expect to sell 20,000 jackets and 20,000 units of healthcare products by 2011-12. There is a huge demand for these products. At present there is no product in the world that can match the quality of our apparels and healthcare products. Last year, our revenue was Rs 27 lakh (Rs 2.7 million). We expect this to rise to Rs 6 crore (Rs 60 million) next year and Rs 50 crore (Rs 500 million) in five years. 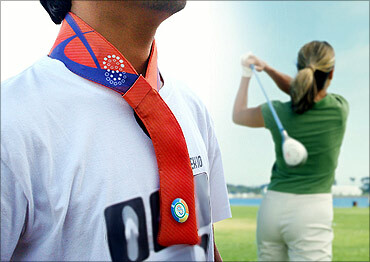 Image: Neck wrap for sportsmen. What are the advantages and disadvantages of running a company in India? Being born and brought up in India, I am basically very attached to this land. It is easier to get a good workforce in India. Since I know the local landscape it is easier to get some things done. India being a growing economy offers a good opportunity for a business as well. So I believe its best to start a company here and perhaps have a subsidiary in the US at a later stage. There are too many bureaucratic hurdles, which hampers the flow of work. Funding is also difficult to get in India. What are the reasons for your success at such a young age? What is the best compliment you have received? Thinking differently is an answer to many problems. I am a very self motivated person and I have the drive to get ahead despite hurdles. I connect with people very easily so I have lot of friends. We have got a great response for our products. The marketing head at DuPont called our product as one of the best products launched in the last 10 years. Other people who use the jacket said it is an amazing product. What are the most important things that entrepreneurs must have to succeed? Entrepreneurs must be very motivated. This motivation must not be out of frustration. You will not succeed if you start a venture just because you are frustrated with your job. You need to be passionate about your work. You should know to control finances and have a risk taking ability. They should also think differently and be aware of the market realities. You need to put in a lot of hard work. For me, it just two activities: work and sleep. 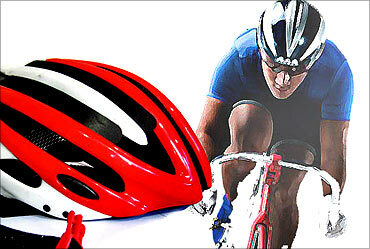 Image: ClimaWare-head gear for sports. It is a fulfilling experience. I just had one person with me when I started the company. Now, we are a 15-member strong team. Though I had the technology, I struggled for about two years testing the product, making improvisation and working on other products. But I always believed that if I worked in any other company, I would not be able to bring out my true potential. Now, I am happy that I have been able to make as much money as I would get from a corporate job and I have got satisfaction no job can ever offer. What can be done to create more innovators, entrepreneurs so that India can be an innovation powerhouse? India is a very attractive country with highly creative and intelligent people. But their intelligence is not channelised in the right direction. We need to enhance our creativity. The next generation must mould India in the right direction. If we do things differently, we are punished by teachers. Right from childhood, we enter this race for marks and ranks. The 10th and 12th standard examinations create so much pressure on the students. In this process, we fail to learn and understand things in the right perspective. We are also very selfish, while we believe in keeping our houses clean, we have no problem in throwing garbage on the streets. India needs a huge transformation. It would be too idealistic to say this but I really wish I could bring about a change across different systems in India starting from education. I would like to bring about small changes which can have a far reaching implications. If I find like minded people, I do not mind even joining politics to build a new India. Unless someone takes the first step, nothing will change. A school dropout's invention for his mother! How this startup simplifies law for the common man! India among the world's most corrupt nations!